U.S. President Donald Trump's impending "deal of the century" intended to resolve the Palestinian issue once and for all and with it bring "peace" to the region will be dead on arrival. The leaked details of the deal provide recognition of Israel's sovereignty over Jerusalem and sets-up a "Palestinian state" while possibly annexing the settlements with 20 percent of the West Bank to Israel proper. Other ideas include the total demilitarization of Palestine, thus leaving the already tormented population to face the never-ending Israeli violence. Ideas on what to be done with the Gaza Strip are hazy, but the possibility of maintaining the status quo in the area is a distinct possibility. A Palestinian official familiar with Trump's "deal" said: "The plan calls for having a Palestinian state with provisional borders on half of the West Bank and the Gaza Strip, without Jerusalem, and calls for humanitarian solutions to the refugee issue … The deal calls for building a 'new Jerusalem' for Palestinians from the surrounding villages and communities." Critically, and based on the above report, the deal of the century will not include the implementation of the right to return for refugees to their stolen homes and lands, but instead offers a vague "humanitarian solution" to it. The multilateral Oslo framework offered various ideas on dealing with refugees but none focused on U.N. Resolution 194. All the plans centered on serving Israel's needs by offering to take Palestinians to a third country — including offers from Canada and Australia. European countries and the U.S.' involvement in the "peace process" are designed to protect Israel and punish Palestinians for seeking a peace based on justice. The "deal" is everything that Israeli Prime Minister Benjamin Netanyahu and his government are looking for and provide iron-fist control of all historical Palestine, despite the fictitious illusion of an independent "Palestinian state." Here, Palestinians have arrived at the South African independent homelands model set-up under the Apartheid regime to give the impression that black South Africans were enjoying "independence and freedom" while, in reality, they had neither under the racist white rule. Preparatory steps are underway to push Trump's dead on arrival "deal" through the region and framed as anything but a continuation of Apartheid under a new and improved structure. The ongoing preparation included a critical concession from Saudi Arabia — which has extended a de facto recognition of Israel while downgrading the status of the Palestinian issue to a secondary status and elevating confrontation with Iran as the primary strategic threat to the region. Under this alignment, Israel becomes a critic strategic ally for Saudi Arabia and the other Gulf States seeking confrontations with Iran and the containment of that supposed threat. "It is about time Palestinians take the proposals and agree to come to the negotiation table, or shut up and stop complaining," was a statement attributed to Saudi Crown Prince Mohammed Bin Salman in a meeting held in New York with the heads of the American Jewish Organization. The wheels in the region are moving fast, and the new public alignment has led to a total abandonment of the Palestinians by Saudi Arabia, Egypt and the other Gulf States. More importantly, the arrival of John Bolton to the National Security Council means the drums of war with Iran are beating ever louder and the pressure to silence the "Palestinian noise" will accelerate in the days and months ahead. In response to the preparatory steps, Palestinian President Mahmoud Abbas called into session the Palestinian National Council (PNC) with an agenda focused on the deal and the possible response, a call to suspend the recognition of Israel. The PNC has not met in over nine years and it is doubtful that the call for suspension will have any real impact considering the regional and global alignment of forces. Furthermore, the membership of the PNC was handpicked by Abbas and his allies, thus lacking real representation of the broader Palestinian society inside and outside historic Palestine. The PNC meeting and whatever comes from it will have limited, if any, impact outside of the Palestinian Authority circle and will further cement the fragmentation of Palestinian society. Critically, Abbas' opening session speech veered into a rightly condemnable and totally wrong framing of the causes of the Holocaust. Blaming the victim is not ethical or moral since it is the same argument often deployed by Zionists on the causes of Nakba and currently some Arab States against the Palestinians for lack of just peace and implementation of the right of return. Palestinians are ill-served by Abbas' linking of Palestinian rights to the Holocaust. We must assign the responsibility to Nazi Germany first and foremost and Europe in general for the crimes committed against the Jews before and after World War II. At the same time, Great Britain, and currently the U.S., should be held responsible for their continued support of Israel, as a settler colonial state. Europe's Jewish question has been "solved" by facilitating the transfer of European Jews to Palestine and aiding and abetting in the expulsion of Palestinians. This basic fact and the strategic thinking behind Great Britain's creation of the Zionist State as a buffer state to protect trade routes passing through Egypt should not be confused with the long history of anti-Semitism — and I would add Islamophobia — dating back centuries before the 1492 expulsion and inquisition. Rejecting anti-Semitism and all that is connected to it is part of the de-colonial struggle that we must undertake with like-minded Jews and others that want to pursue a liberation of the mind first, then break the physical chains that are locking the human potential. Palestinians are burdened with the arduous but doable task of taking on Zionist occupation and dispossession and at the same time, challenging the European roots of anti-Semitism and Islamophobia that were planted during the colonial and post-colonial period. Anytime we fall into anti-Semitic and Islamophobic thinking, an epistemological trap constructed by a certain European mode of thinking, we breathe life into a major trans-historical lie that has led to the deaths of millions. Reconstituting Palestine does not mean replicating or imitating the European nationalist and ultra-nationalist model that got the Muslim world and the region as a whole into the ongoing bloodbath. Reconstituting historical Palestine means a total rejection of all forms of anti-Semitism, Islamophobia and racism while affirming the dignity and equality of Jews, Christians and Muslims as well as for all freedom-and-justice-loving people. 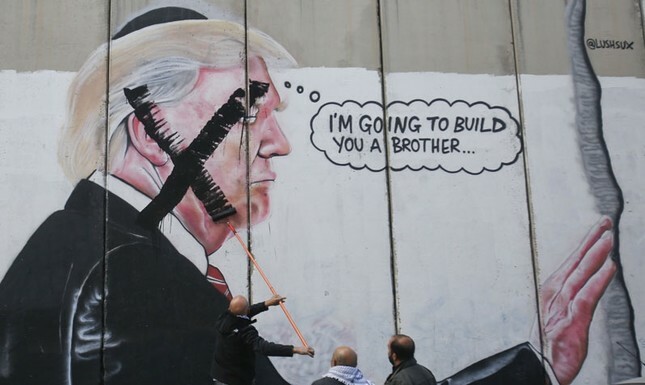 Trump's "deal of the century" is dead on arrival because it continues to build upon the original sin of Zionism and European dispossession of Palestinians. The "deal" rewards settler colonialism and attempts to push the clock back by embracing Israeli Apartheid and cloaking it in legitimacy and extracting maximum concessions from Palestinians. What this "deal" fails to recognize is that the wheels of justice are moving faster than the Apartheid walls, and Trump and the Israeli leadership are attempting to rescue and revive a dying settler-colonial project.